As I look out my window I can see the pink rhubarb shoots coming above ground, I have to summon all my will power to stop myself plucking them from the plant as soon as they are a couple of inches high, instead of allowing them to mature. I have several varieties of Rhubarb the earliest ones tend to be sweeter and pinker in colour that the later varieties. Delicate sticks of early rhubarb ought to be treated with care to maintain their shape and colour. The following recipe does just that. The creamy whiteness of Pavlova provides a stunning background for the pink rhubarb; I have sprinkled some crushed pistachio nuts on top to add a little texture. Put the egg whites in a large clean bowl, stainless steel is preferable, add a pinch of salt and whisk until they hold stiff peaks. Gradually add in the sugar, whisking all the time, continue whishing until the eggs whites are stiff and glossy. Last of all fold in the vanilla seeds, vinegar and cornflour. Pile the mixture on a baking tray lined with parchment and spread into a 23cm/9inch circle, smoothing the tops and sides with a spatula. Bake for 5 minutes at 180C then reduce the temperature to 120 and cook for another hour and 15 minutes. In a wide based saucepan simmer the sugar and water until the sugar is dissolved, then add the orange flower water. Cut the rhubarb stems into 2.5cm/1 inch pieces. Bring the syrup to the boil, drop in the rhubarb pieces and take off the heat. Allow the rhubarb to soften in the syrup as the syrup cools. When you are happy that the rhubarb is cooked, gently remove the rhubarb from the syrup. Put the saucepan containing the syrup, whisk will now be infused with the delicious flavour of rhubarb and reduce by half, and allow to cool. To assemble, transfer the Pavlova to a pretty plate, spread the cream onto the Pavlova, plate the rhubarb pieces on the cream and drizzle with the syrup. Sprinkle crushed pistachio nuts or shredded mint on top and enjoys your first taste of spring. This simple fruit cake is really easy to put together and lasts for a week or so in a sealed tin. Line a 9inch square or round tin as demonstrated. Sprinkle some split almonds on top. Bake for ½ hour at 170oC. Bake for 1½ hours at 140oC. Of course I made it myself...! Sift Flour, salt and yeast into a large bowl. Make a well in the centre and pour in the warm water and the olive oil to form a soft dough. Knead for 10 minutes until smooth and elastic, then place in a greased bowl. *Cover with a cloth and leave to rise in a warm place for 1½-2 hours until doubled in size. Knock back the dough and divide into two pieces. Roll out into 2 10 Inch rectangles and place on greased baking sheets. Brush with egg wash and sprinkle with poppy seeds. Cover with damp cloth and leave to rise for 30 minutes. Bake at 200oC for 20-25 minutes, spraying with water twice during cooking. Transfer to a wire rack to cool. Serve warm is possible or on the same day. Beat the February blues... The wind is blowing, rain lashing against the windows, time for comfort food. This is a delicious warming dish, made in minutes and a favourite with all the family. Cut the sausages into 2.5cm / 1” pieces with kitchen scissors, and dice the bacon. Heat the oil in a large flameproof casserole and add the sausages. Fry over a moderate to high heat for 8 minutes, turning frequently until the sausages are golden. Then add the bacon and cook for 1 minutes, stirring. Meanwhile halve, peel and slice the onion. Peel and crush the garlic. Rinse and drain the beans; you don't have to keep them separate. Remove the sausages and bacon from the casserole, drain on kitchen paper and set aside. Pour away all but 2 tbsps of fat from the casserole. Add the onion and garlic and cook over a moderate heat for 5 minutes, until softened. Stir the tomatoes and their juice into the onion and add the herbs, mustard and tomato purée. Rinse out the tomato can with 1/3 of a can of water and add it to the mixture. Bring to the boil, stirring, then add the drained beans. Return the sausages and bacon to the casserole and season to taste. Reduce the heat, cover and cook gently for a further 10 - 15 minutes. Serve the cassoulet accompanied by a green salad and some warm crusty bread. Bake this stunning cake for the ones you love. Don't be but off by the long recipe it is really easy to make. Crystallised rose petals can be replaced by chocolate or jelly hearts. 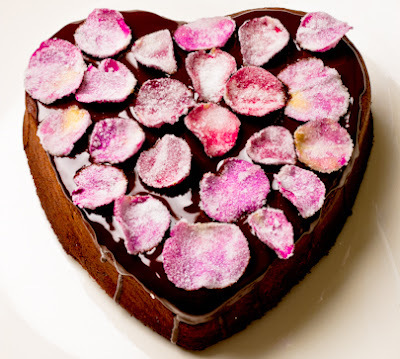 To make the cake; Line base of a 23cm tin (heart shaped if possible but if you don't have one a round tin will do nicely), with a disc of greaseproof paper and grease the sides of the tin with butter. Using an electric mixer beat the eggs, caster sugar and vanilla for about 10 minutes until mixture is thick and creamy and doubled in size. Twice sieve the plain flour and cocoa powder. Using a metal spoon gently fold the flour into the mixture. It is very important to do this gently – have patience, if you are too vigorous you will knock the air from the mixture and your cake won’t rise. Pour the mixture into the prepared tin and place in pre-heated oven. Bake for 25-30 minutes or until the cake starts to come away from the sides of the tin. Remove the cake from the tin carefully turn out to cool on a cooling rack. To make icing; Melt the chocolate and butter gently together in a bowl set over a saucepan of simmering water, don’t take your eye off it! When the cake is cool split it in two horizontally with a bread knife. To make the filling; Whip the cream until soft peaks form - add a dessert spoon of castor sugar if desired. In a small bowl mix the apricot jam and brandy together. To assemble; Spread the apricot jam and brandy mixture on the bottom half of the cake. Next spread the whipped cream over the apricot and brandy. Gently place the other half of the cake on top. Next pour and spread the chocolate icing over the top of the cake (use a pallet knife dipped in hot water to help spread icing), allow to rest for 5 minutes then decorate with rose petals.